What are 4-Panel Bulk Bags? A 4-Panel Bulk bag derives its name directly from its construction design. In this type of bulk bag, the 4 sides are constructed from 4 separate fabric panels which are stitched together at the edges with each other. A separate piece of panel is used to make the square bottom of the bag. According to the weight, the bag’s panels may or may not be hemmed. Hemmed edges are known to provide better support and maintain the square shape of the bag efficiently. What are the advantages of 4-Panel Bulk Bags? 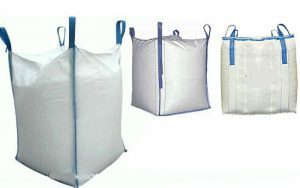 4-Panel Bulk Bags are most useful for storage and transport as they are easier to stack. This helps to save storage space and allows larger number of bags to be stored in it. What are 4-Panel Bulk Bags useful for? The 4-Panel Bulk Bag is the ideal choice for industries that require packing, storing and transporting mainly solid and uniform shaped products mostly. With stronger materials, finer type of substances can also be easily transported due to the square shape of the bag. Why choose Simplex Chemopack 4-Panel Bulk Bags? Simplex Chemopack Private Limited has been providing durable and reliable packing and transporting solutions to various types of industries. The company provides 4-Panel Bulk Bags in a variety of sizes, dimensions and fabric types to ensure that maximum number of customers can get access to durable packing solutions.